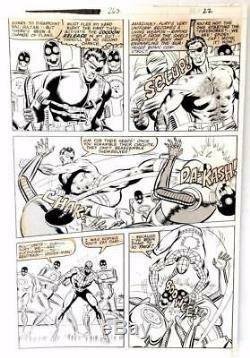 Captain America #265 Marvel 1982 (Original Art) Page 22 Mike Zeck Spider-Man. We offer LARGE pictures that once clicked, you can easily drag to your desktop for a closer look! A Beautiful Page by Mike Zeck, Inked by John Beatty! The image area is 11" x 17". Check out all of our other. Listings for more treasured collectibles. Boxed and well cushioned with bubble wrap/newspaper/packing peanuts. Auctiva Offers Free Image Hosting and Editing. Listings get noticed with Auctiva's Mobile Responsive Listing Templates. The item "Captain America #265 Marvel 1982 (Original Art) Page 22 Mike Zeck Spider-Man" is in sale since Friday, December 22, 2017. This item is in the category "Collectibles\Comics\Original Comic Art\Interior Pages". The seller is "collectors_comics" and is located in California.